Create an inclusive environment. Welcome teens and adults of all abilities to workout together with fitness equipment that is accessible and easily understood by first-time users. Meet the needs of all fitness levels. Look for outdoor fitness equipment that will meet users at their level—whether that’s beginner or advanced. Offer a variety of workouts. Provide equipment that targets various fitness areas such as muscle strength, cardiovascular health and balance/flexibility. Design to fit your environment. 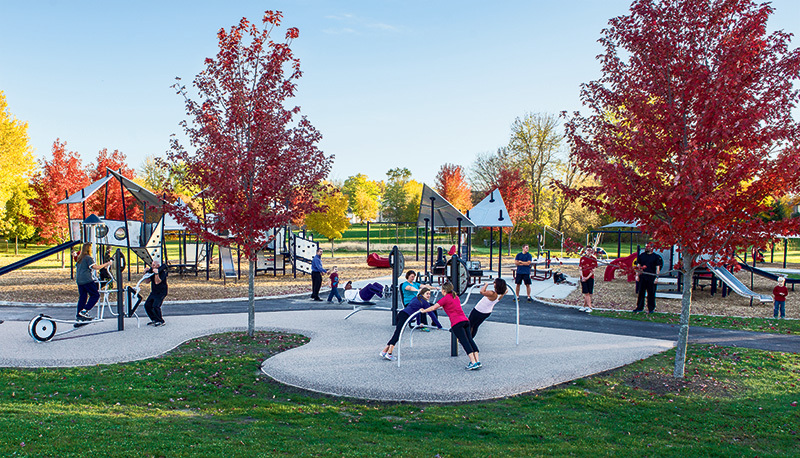 Consider where your outdoor fitness equipment will get the most use—along a walking trail, next to the playground or ball field, or at a senior living community—and make sure the equipment’s size and aesthetic will fit the environment. Check out the refreshed, contemporary design of the HealthBeat® outdoor fitness system, which fits the above criteria. Our resistance technology delivers a better workout, and signage includes links to instructional videos that can be viewed on a smart device while at each fitness station. Learn more at playlsi.com.